Although the rumours of a budget iPhone being offered in multiple colors have been around for a while, that seems exactly what the iPhone 5C will come in. Apple’s attempt to conquer the mid-range smartphone market will come in colorful plastic casing that has been leaked out of the supply chain numerous times. Whilst the casing of the iPhone 5C has been leaked numerous times before, there were never actually any components to these empty casings, but now recent leaks show parts that also match the various colors the iPhone 5C will be offered in. The volume buttons of the iPhone 5C have been leaked in red, green, yellow, and blue – the colors that the iPhone 5C will be offered in when released in just under a months time at Apples’ event. iPhone 5C – C for Colors? Although the volume buttons aren’t exactly an exciting part of the iPhone, they are only one of few input components that actually externally get installed to the chassis of the iPhone. Consequently, to see a bunch of colorful volume dials is actually quite significant, because it confirms that the chassis of the iPhone 5C will be of a similar color. 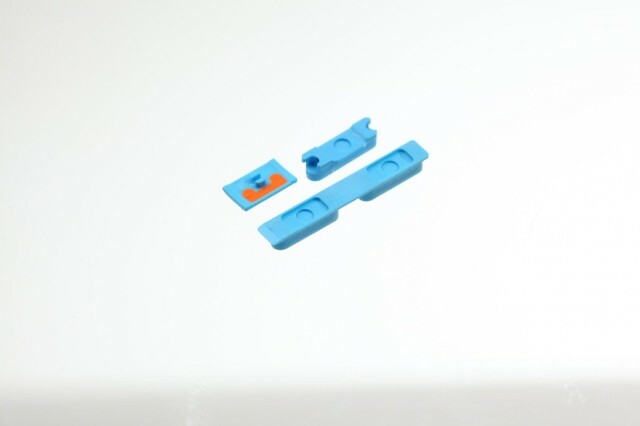 The parts do look of very low quality, almost plastic, which again the iPhone 5C is suspected to be made of in order to achieve the budget mid-range iPhone price bracket Apple are aiming for. However, as with any leaks, you need to take them with a pinch of salt, as all leaks could be misleading. But if these are accurate, then it looks like the iPhone 5C, which is suspected to be released in under a month, will be offered in Red, Green, Yellow, and Blue. What do you guys think? Are these buttons legitimate? What do you think of the colors? Let us know in the comments section below.